In this digital era, if you want to take your business to the next level, having a website with dynamic features is a must. PSD to HTML5 conversion is the most effective process to create such sites. Being the latest version of HTML, HTML5 plays a significant role in creating a website. It has become the imperative markup coding. On the other hand, PSD allows the designer and developers to code the design with ensuring every creative aspect. Therefore, converting PSD to HTML5 is the best option. 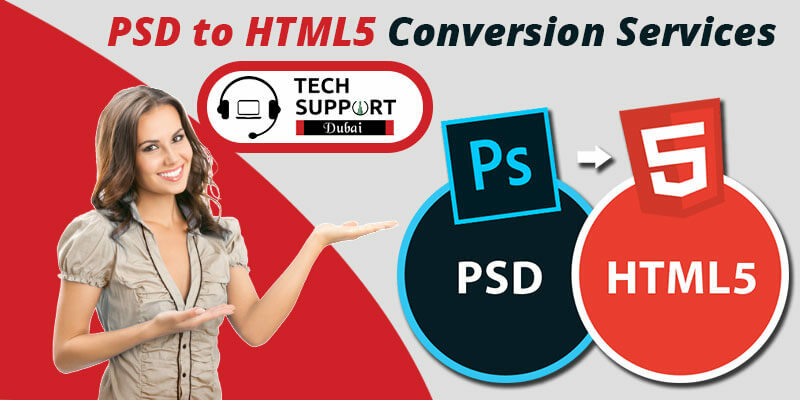 If you are searching for a satisfactory service provider who can offer you the best PSD to HTML5 conversion services, Tech Support Dubai is the best to choose from. We work with efficient coders who are experts in converting PSD to HTML5. We also make sure that your code is properly organized. To deliver organizational business goals, we try to make the process more inclusive for the website. PSD to HTML5 conversion offers rich feature and surely enables your website with the great design and functionalities. Besides the advanced features, this conversion process saves lots of time and cost of the clients as well as web development industries. Therefore, it improves the productivity of your business. Have a look at the basic advantages of PSD to HTML5 CSS3 conversion. Embedding the relevant keywords give huge traffic towards the website. Converting PSD to HTML5 supports the original format with an absolute designed layout. We are your ultimate choice when it comes to PSD to HTML5 conversion. Our web designers and developers have years of experience in this field and can provide solutions according to your requirements. Designing and coding the HTML5 files from your PSD files becomes easy with our expert assistance. We care about your budget and hence offer solutions at a cost effective rate. Our specialty is that we listen to our clients and do the needful. We do not overcharge you for our services. Opt for our service and experience the difference. In order to develop your website with outstanding features, use HTML5 features at the earliest. In case you are unaware of the PSD to HTML conversion process, talk to our technical experts at Tech Support Dubai. We are among the best service providers to offer affordable PSD to HTML5 conversion services in Dubai. Dial our helpline number: 042053349 and talk to our experts about your web project. Our online services are also quite popular. For more details, you can chat with our tech experts through live chat facility or can drop us an email at our registered email id. Hurry and connect with us to grab the immediate assistance from our proficient developers.